Noel seemed to prefer offhand sincerity, collages of lines that sound good sung, their emotional payoffs poking through puns, rhymes and boilerplate. According to both brothers, the “So, Sally can wait…” line that rouses “Don’t Look Back In Anger” from its slumberous verses was a happy collaborative accident, Liam pouncing on a phrase Noel had pulled from the air and ordering him to keep it. But the whole song feels like a similar patchwork, really good lines – “Please don’t put your life in the hands / Of a rock and roll band” side by side with fumbling about slipping inside the eye of your mind. The magpie phrase-lifting of the title sets the tone for the whole thing. It might seem perverse to focus on “Don’t Look Back In Anger”’s lyrics, which are a tiny part of why it got to Number One and why it’s one of the band’s milestone tracks. But the rest of it leaves me almost completely cold, even when I can see what it’s up to. 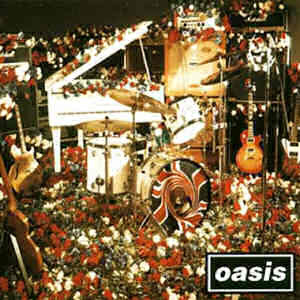 The opening piano, a lift from “Imagine”, is one of the group’s least subtle bits of behavioural priming – this is going to be a Big Song, Noel shooting for the Hall of Fame with a pained, ponderous rock ballad. I rarely like that kind of thing, and no surprise, I don’t really like this. It’s a treacly, high-gravity listen – guitars and drums and strings all jostling for space, dragging each other down. And while Liam’s singing wouldn’t have fitted this song’s rueful tone, Noel’s delivery veers between heartfelt and maudlin – particularly when he lets the song fizzle out at the end. Comparisons to “Wonderwall” – with Liam in total, electrifying command of a much tighter arrangement – are inevitable, and don’t flatter this song. But something I do appreciate about it is that, in the context of rock tear-jerkers and lighter-wavers, the scrappy lyrics are an asset. There’s a sort of story here* – bye, Sal! – but no message or particular claim of wisdom, nothing you’re expected to agree with. Instead, the song flails about in a sump of self-justification and sentimentality, and is all the better for it. I have been drunk, and I have put big, sentimental rock music on when drunk, and felt the beery swell of nameless emotion just out of reach of my befuddled mind, and while I’d never use this track for it, I can recognise that use in it. That just-out-of-reachness – that catalyst for messy, dredged-up, inchoate feels – is the one way “Don’t Look Back In Anger” does stand comparison with “Wonderwall”. *Though one particular coherent reading did jump out at me – what if that opening steal isn’t just a signal of the type of song this is going to be, but is an explicit admission: this song is Lennon fanfic, and Lennon is its “you”. It’s a fantasy where Noel gets to be John’s buddy – a Mary Stu. “Take me to the place that you go…” – and there’s Noel hanging out in Strawberry Fields, being there at the bed-in, helping him out – saving him, maybe – with some down-to-Earth Gallagher wisdom, vibing off his presence as “Sally” is left behind – no wonder Liam didn’t get to sing this – and kissed off with a snide cultural reference because that’s the kind of thing John Lennon does for Noel, his best friend forever. And there, walking on by, we shall leave them.